Bullying has been a school-age reality since the first time children were brought together in one room schoolhouses to learn the Three Rs. But just because that type of emotional and physical harassment, commonly called bullying, is frequently associated with juveniles, it is also prominent in other places of socializing, competition, and learning—the workplace. Not only that, the bullies of the workplace typically use the same tactics as those in the classroom; namely intimidation, humiliation, insults, and blackmail. 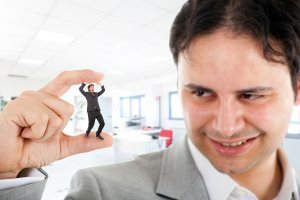 Unlike the millions of unfortunates in schools around the world, workplace bullies don’t have to be tolerated in the name of popularity or reputation. In fact, delivering a professional response to workplace bullies will both waylay future damaging behavior by the bully and put your own maturity and formidable intrapersonal skills on display. The following bully types may be using the traditional tactics of the schoolyard meanie or utilizing technology to raise their harassment to new levels, but each of them can be responded to effectively and definitively. The newest (and most media friendly) bullies are those using social media as their weapon of choice. Typically using Facebook to create unflattering “fan” pages or to post humiliating updates about coworkers, social media bullies can menace you from the home or office and can hurl snark and venom mere moments after an event occurs. But fortunately for you, and unfortunately for the bully, the behavior is causing far more damage to him or her than to you. The best way to manage such a bully is simple—to ignore the attacks. Professionals scorn and condemn this type of immature acting out and the bully will soon suffer the consequences of his or her inappropriate passive-aggressive shenanigans. A second form of technological bully is the email bully; one who uses emails to transform an otherwise professional exchange of communiqués into a public argument. The primary tool of the email bully is the cc option allowing him or her to berate you or your performance in front of the virtual faces of your colleagues and superiors. Often, the public, bullying emails take on an entirely different (and aggressive) tone than exchanges made face-to-face. The primary defense to such an attack is to simply not respond to the emails. Instead, rely on face-to-face encounters where the inflammatory rhetoric should stay at a minimum. Let the bully know that you are unsure of why you are being attacked and how to interpret the hostile action and would like to chat privately about the incident. This should quickly defang the would-be bully, who will more than likely change from a mindset of pettiness and cattiness to something more reasonable. Finally, there is the conventional bully who relies on personal threats, intimidating stances, and character attacks. This type of bully usually seeks to use your personal life against you and often uses aggressive and insulting language at you or when speaking of you with others. The unreasonableness of the conventional “mean” bully typically disallows the approaches used for the pettier, but less openly hostile bullies. The only way to go about handling such a bully is to approach your supervisor, the bully’s supervisor, or HR who can appropriately reprimand the bully and sanction him or her through official channels. Wasting your own time and energy on addressing the attacks of the bully is counterproductive and will potentially only work to provoke the bully. In the face of childish bully tactics, you should act like a consummate professional and defer punishment administration to the appropriate entities. No matter which type of bully you are faced with in the workplace, the most important response is one of professionalism and maturity. Always take the high road with the assurance that the bully will eventually suffer for his or her lack of professionalism. The more you distance yourself from the petty attacks and provocations of the bully, the more respect you will receive from your bosses and co-workers.